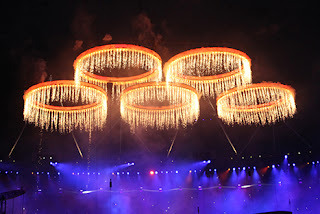 As someone who has written extensively about the formative power of "secular liturgies," you might think I'd be primed to analyze the opening ceremonies of the 2012 London Olympics as an example of just such a "secular" liturgy. In other words, you might think I'd be sympathetic to George Weigel's critical analysis of the opening ceremonies as "The Liturgy of the World State." But you'd be wrong. Indeed, I think Weigel's account of the opening ceremony as a "liturgy" betrays a pre-Vatican II notion of the liturgy as spectacle, as something to be observed (rather than something inviting "full, conscious, active participation" as the reforms of Sacrosanctum Concilium emphasized). Liturgies should not be confused with "ceremonies." Liturgies are not "events"--one-off bedazzling spectacles rife with ritualistic symbol. I don't deny that the Olympic opening ceremonies were an affective, symbolic enactment of a story. But while that is a necessary aspect of a "liturgy," it's not a sufficient criterion. Liturgies are not just symbolic and ritualistic; they are enacted stories that are (1) repeated and (2) participatory. The Olympic opening ceremonies--while spectacular and ritualistic and, without question, infused with a story--do not function liturgically because they lack these other aspects. There is no repetition of any version of the opening ceremonies (indeed, novelty is THE defining goal). But that's not to say that there aren't plenty of secular liturgies in our culture that do inscribe in us the story that Weigel is worried about. But Weigel seems to miss their liturgical nature because he confuses liturgy with spectacle--just the notion that both Protestants and Catholics agree needs to be reformed.